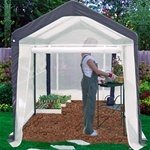 Portable Greenhouse Kits | Indoor & Temporary Use | Free Shipping! 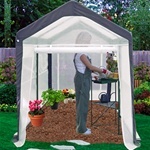 Portable greenhouse kits with free shipping! 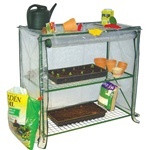 A portable greenhouse is a great solution when you don't have much outdoor space! Our Weatherguard Deck & Patio kit is the perfect portable greenhouse for a small patio or deck. This unit could also be placed in the corner of your garden. The Weatherguard portable greenhouse bolts down in place, but can be unbolted and moved at anytime. Our smaller green house units are perfect for smaller spaces, whether indoors or out. Some of the kits seen here will fit easily on a tabletop, work bench, or shelf. Are you looking for a unique or unusual gift item for that special someone in your life? Whether you're shopping for a girlfriend, husband, mom, uncle, or best friend... at Home Products n' More, we've got you covered! Check out our unique gifts category, with a variety of interesting and unusual gift ideas for everyone. We've got a complete line of side steps, truck racks, and other vehicle accessories for the auto enthusiast. We've also got high quality trellises, arbors, and park benches for the gardening fanatic or outdoor lover. And for the java junkie, we've even got our own line of premium coffees, roasted to your specification at the time you place your order. We're sure you'll find something for everyone--or maybe even something for yourself! Home Products 'n' More offers a line of seasonal storage products for organizing and storing all your holiday decorations. We offer storage solutions for your holiday wreaths, lights, a holiday village or other boxes collectibles, and wrapping paper and supplies. You can find all these products and more in our Seasonal Storage category. Be sure to check out our popular line of TreeKeeper storage bags for artificial Christmas trees. These bags will protect your tree from dirt and damage while in storage. TreeKeeper bags come in a variety of sizes and styles, including the PRO line that also comes with a unique rolling tree stand for your tree. If you need help find a particular item, or would like to place your order by phone, please call us at 800-690-0132.